Nerdfect Strangers: How did the concept for Metalshark Bro come about, what is it about, and how has it evolved over the collaborative process? 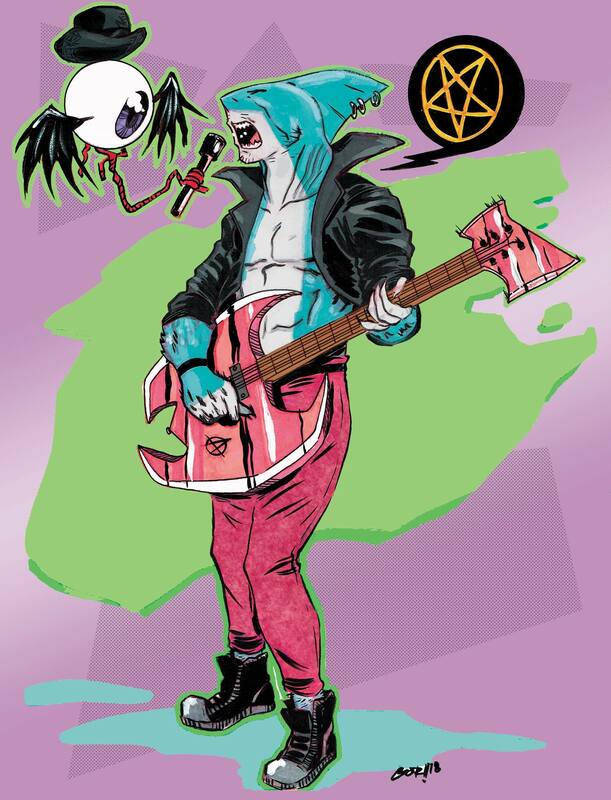 Bob Frantz: Metalshark Bro was born on the long and desolate highways of the Appalachian Mountains. In the early hours of a brisk and foggy October morn, I was weary and punch-drunk from a long weekend of friendship. Right outside of Richmond, Va, I heard a radio DJ read a news story about a scientist placing speakers blasting AC/DC in water to gauge the reaction of sharks. The idea went off like a bomb in my skull. I frantically phoned my friend and co-writer, the majestically bearded Kevin Cuffe, to discuss this revelation! Over the next 7 hours, Kevin and I giggled like stoned teenagers as we created the saga of the demonic, half-man, half-shark killing machine. Kevin Cuffe: We were thinking it’s stupid and silly but we’d just laughed so much at the ideas, we had to do it. We’d just come off writing something more serious and it was a nice way to still be creative but with less intensity involved. Our process is a mix up of just working ideas until we feel they have legs of their own, the characters develop their own personalities no matter which one of us is writing them, they stay consistent. NS: The character designs are just awesome. I’ve seen as many people talk about Metalshark Bro as Ira the flying eyeball in this way. Would you speak on them a bit? BF: Kevin and I had rough ideas of what we wanted the characters to look like but Walt really brought the characters to life. Metalshark Bro was a bit more obvious, it’s a shark man, ya know? But Ira took a bit more creativity. 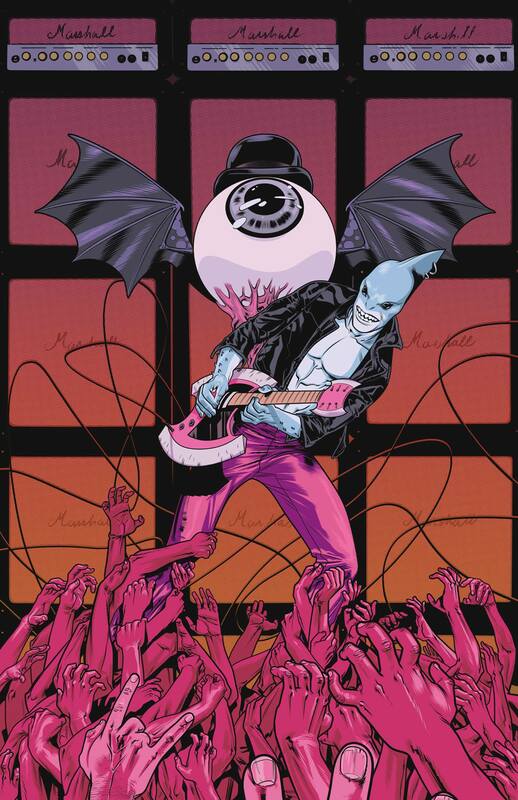 Kevin added Ira to the story because in his mind “nothing is more metal than an eyeball with bat wings.” That is all fine and dandy, but how do you give something that simple personality. Well, Walter managed to do just that. The hat was all Walt and it’s hilarious. I mean, it’s so silly but the entire book is silly. 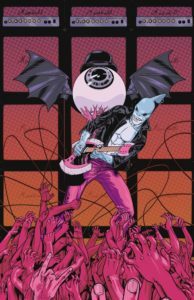 KC: I was like, its gotta be something that a kid who is into metal would doodle on his math book, but Ira evolved into Metalshark’s brainy sidekick with a few tricks up his sleeve—err, under his hat. Walter really made the designs something special. Walter Ostlie: I don’t really know where the bowler hat came from. It just seemed right. Possibly because when you see a giant eyeball, you obviously want to see a giant monocle. A monocle wouldn’t work logistically, so next best thing? Floating bowler hat. I also added the nerve endings so that Ira could interact with stuff. I wanted to elevate him beyond just a floating thing. NS: Would you tell us about the Kickstarter? Its goal, end date, pledge levels, and if there are any stretch goals. BF: We have a lot of great rewards for your listeners/readers. Original art, comic pages, enamel pins, a MILLION different prints to choose from some of the best dudes working in comics. The amount of prints shocked and astounded me. 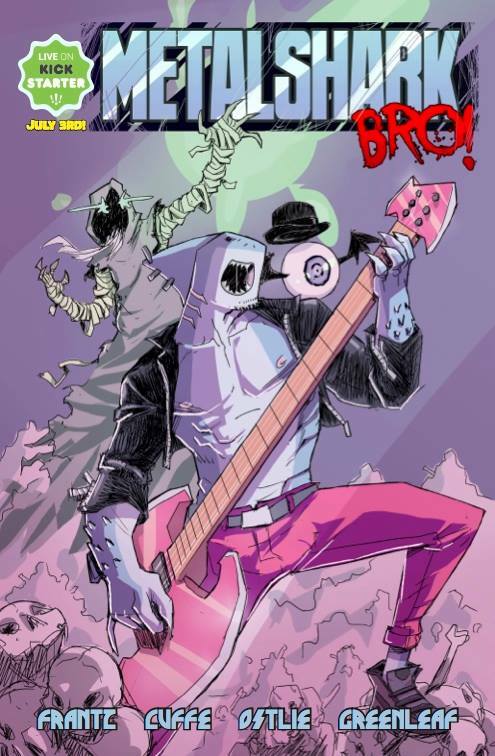 I mean, we have some friends drawing a few, like Drew Moss, Hoyt Silva, Jamie Jones, and Marlin Shoop, but there are other amazing artists that I don’t know that have made art for this thing. Cats like Jason Copland, a dude who made maybe my favorite book last year Kill All Monsters! or Josh Hood, the artist behind the masterfully wonderful We Can Never Go Home, just made their own pieces. It’s a beautiful thing. KC: The Kickstarter started on July 10th and runs until August 8th. We are shooting for $24,666k which is and sounds like an awful lot. When you look at producing the book we shot for the bare minimum possible to get a graphic novel done, which was a bold decision for us all as Bob and I are used to producing single issues. There’s plenty of tiers to choose from and you can add on anything to your pledge to customize your rewards. 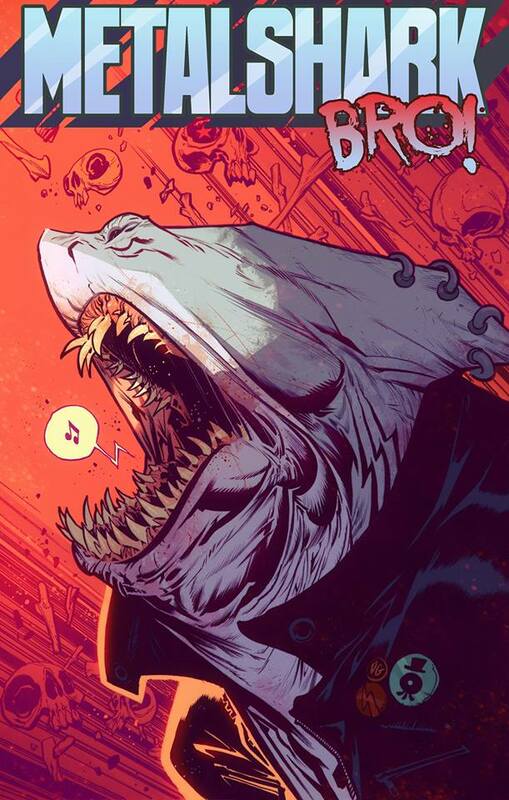 As far as stretch goals, we’ve planned some out to give the backers more content including additional short stories drawn by different artists and more fun rewards like Walter, Bob, and I are willing to get Ira tattoos so the backers know we are just as engulfed in “Metalshark Mania” as they are. We were all blown away when the pin-up art started pouring in because artists thought it’d be fun, which is just the theme of the book. We got a painted piece from Francesco Iaquinta and some really fun versions of the character from Jake Smith, Paul Gori, Christian DiBari, Andrew Hahn, Daryl Toh, Adam Ferris, and many more. 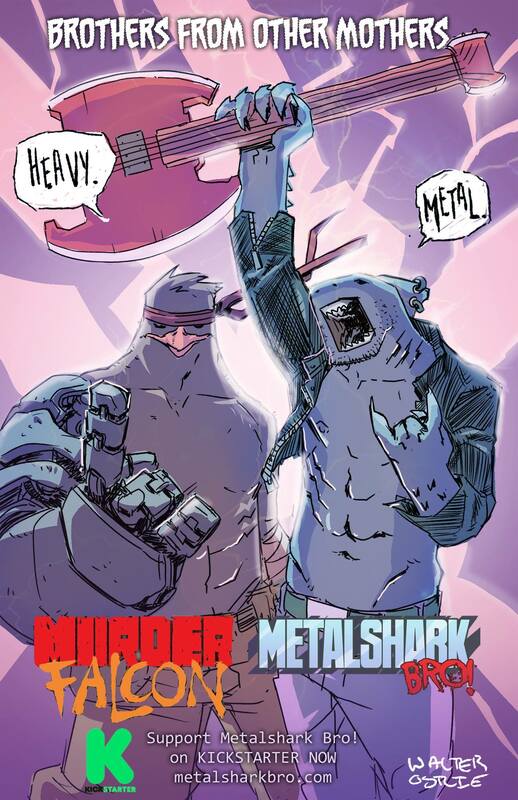 NS: The premise of Metalshark Bro seems to lend itself well to licensing, merchandising, and crossover. Should the campaign prove successful, where would you like to see the concept go moving forward? 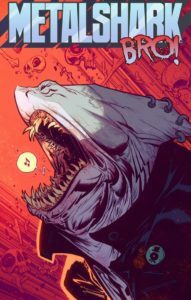 I’ve seen an image of Metalshark Bro with Daniel Warren Johnson’s Murder Falcon from Skybound by Walter, could that be a thing in the future? BF: I’m not too worried about all that other stuff. We NEED to make the book before any of that other stuff can happen. That means we NEED to fund. It’s cool that people see MSB and think “this would make a killer cartoon,” but I didn’t get into this to make cartoons or action figures. I love comics. I love the potential of the medium. There are things, dynamic and wild things that can only do on the page. I love that about comics. KC: I agree 100% with Bob here. It’s great that people want this in other media. And if it happens. we are there for it. But for now, our focus is getting the trade done and into the backers hands, just getting funded would be an achievement. So, that’s where we are focused right now. If the rest of the stuff happens, great. We love making comics and that’s going to stay our focus, Jerry. WO: Metalshark as a cartoon? How sick would that be? Or a 2D retro Streets of Rage joint would be sick. 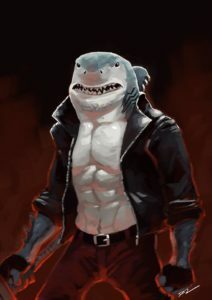 You can pledge to Metalshark Bro here until August 8th. Bob Frantz can be found on Twitter and his publishing company Loophole Comics can be found here. Kevin Cuffe is on Twitter and Walter Ostlie can be found on Patreon, Facebook, Twitter, Instagram, and his website. 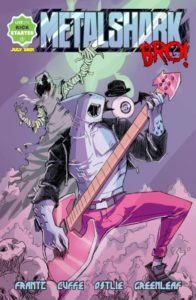 This entry was posted in Comics and tagged Bob Frantz, Jerry Whitworth, Kevin Cuffe, Kickstarter, Metalshark Bro, Walter Ostlie. Bookmark the permalink.